November 2018 news from MaineGeneral Health! Welcome to MaineGeneral's November HealtheMatters ! This month's issue introduces you to MaineGeneral Surgery's Kaitlin Carroll, PA-C, shares some great upcoming events, highlights a recent grant MaineGeneral received to help combat the opiate epidemic...and more! As always, we welcome your feedback at public@mainegeneral.org and wish you a wonderful and safe pre-winter season! You want a health care system that's with you for a lifetime. 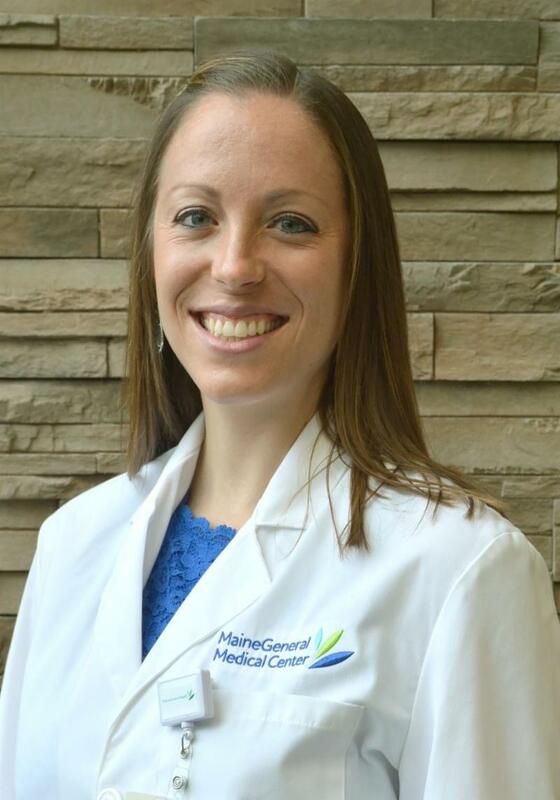 Kaitlin Carroll, PA-C treats patients as a member of the MaineGeneral Surgery (Vascular) medical team and has been a member of MaineGeneral Medical Center's Professional Services Staff since October 2018. Originally from Chichester, NH, Kaitlin completed her undergraduate degree at the University of New England in Biddeford, her physician assistant degree at Franklin Pierce University in Rindge, NH, and now is glad to complete the cycle by returning to Maine. She's always had a special interest in surgery. She worked in both orthopaedic and thoracic surgery before transitioning to vascular surgery and has thoroughly enjoyed each experience. “Although vascular surgery is a newer specialty for me, I'm very excited to learn the ropes and work with such a fantastic team!" she said. “MaineGeneral and the vascular surgery team have been incredibly welcoming, making me feel I'm already part of the family. It's easily recognizable that these family values extend to each patient as well.” Excellent patient care is of the utmost importance to Kaitlin. Outside of work, Kaitlin enjoys spending time with family and friends, working out/participating in various fitness classes, cheering on New England sports teams and exploring all the gems that Maine and New England have to offer. MaineGeneral Horizon Program is welcoming the public to attend its World AIDS Day remembrance and celebration event on Saturday, Dec. 1. 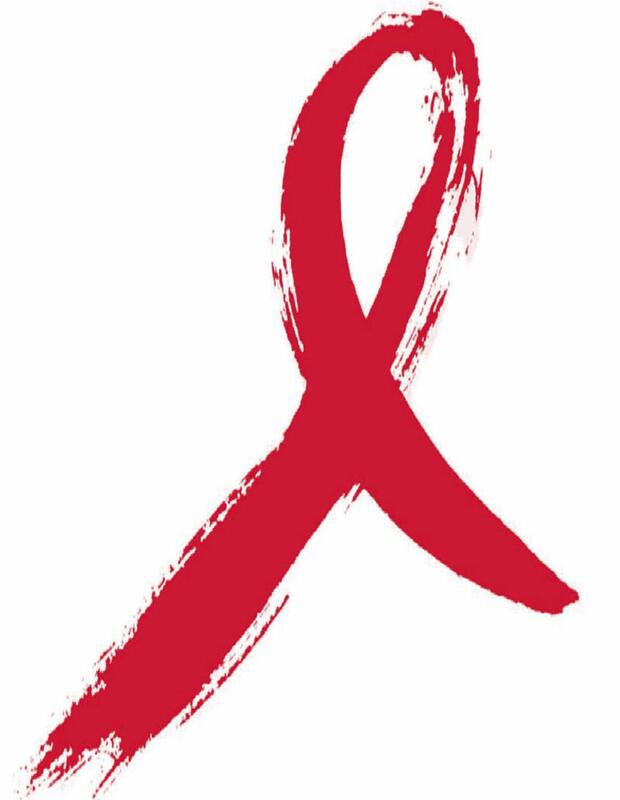 This year marks the 30th anniversary of World AIDS Day, a day to show support for people living with HIV and to remember those who have died from an AIDS-related illness. The event at the Alfond Center for Health in Augusta (35 Medical Center Parkway,1st Floor Conference Rooms) will start with an 11 a.m. showing of the film "Uncle Howard." To reserve a seat to this free showing, please call 588-3506. A Remembrance and Celebration Ceremony will follow at 1 p.m. A section of the AIDS Quilt will be on display and refreshments will be served. To learn more, please call The Horizon Program at 621-3785, option 8. November is National Lung Cancer Awareness Month. 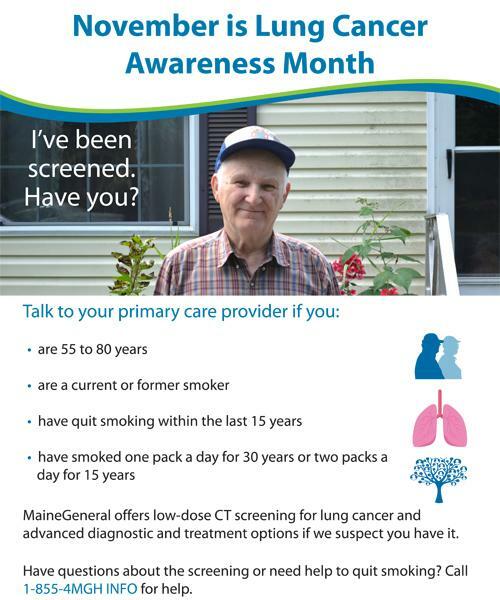 Many people are surprised to learn that lung cancer is the leading cause of cancer death in both men and women in Maine and nationally. In fact, Maine’s lung cancer rate is 30 percent higher than the national average. 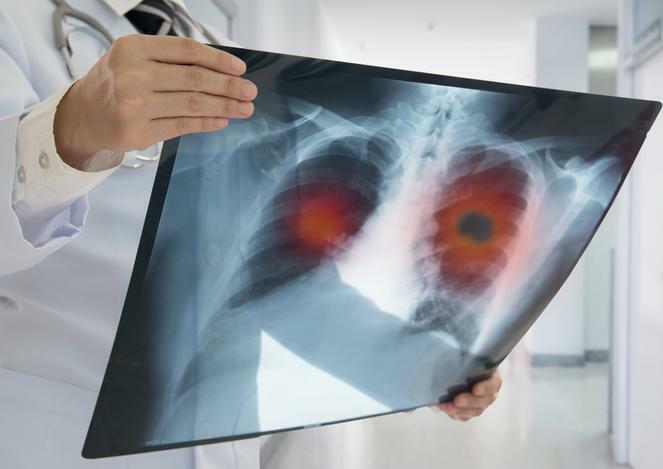 The good news is that a low-dose CT (LDCT) lung cancer screening test is available to detect lung cancer earlier when it’s more treatable. At MaineGeneral, we're with you! MaineGeneral Prevention & Healthy Living received a three-year, $750,000 grant from the Health Research and Services Administration’s Rural Health Opioid Program to address the opioid epidemic in Kennebec and Somerset counties. There were 418 overdose deaths in Maine in 2017, more than twice the number of deaths recorded in 2014. Emergency department visits for opioid overdoses jumped 34 percent in 2017. 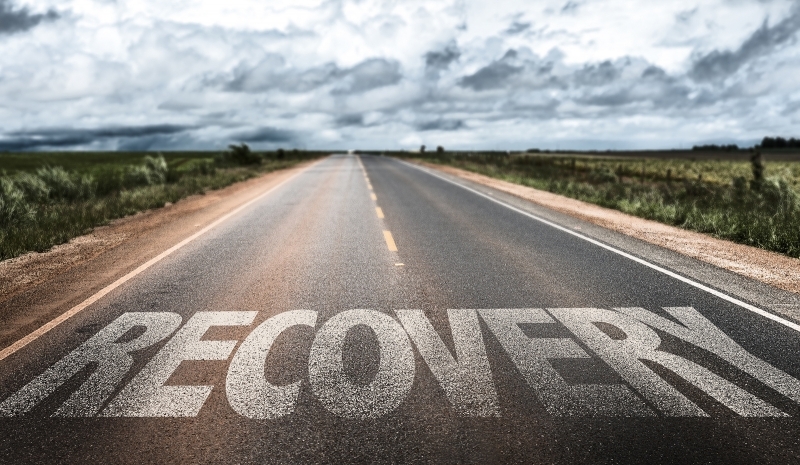 Reduce the impact of opioid use disorder by strengthening and expanding partnerships, increasing treatment options and implementing screening and referral systems. Address the stigma of opioid use disorder that affects both individuals accessing services and available treatment providers. Provide ongoing training to health care professionals to expand a competent provider network. Support health care systems in implementing workflow changes that enhance opioid use disorder screening and care coordination. Bring together families, community leaders, law enforcement, peer recovery programs, social service organizations, behavioral health professionals and medical providers to integrate and enhance current opioid use disorder initiatives. MaineGeneral works with many community partners to address the opioid epidemic and intends to expand its partnerships with this grant. MaineGeneral's Kennebec Pediatrics and Winthrop Pediatric & Adolescent Medicine were recently recognized as a 2018 Let’s Go! Healthcare Site of Distinction for their efforts to help prevent childhood obesity. Regularly engaging in respectful conversations with patients about healthy behaviors by using the 5-2-1-0 Healthy Habits Questionnaire at well-child visits. We thank our pediatric practices for the great work they do every day to help give our youngest patients the best start in life! Imagine hundreds of glowing luminaria bathing the Gardiner Common with warm light - not a solemn remembrance, but a celebration of life. Luminaria will be lit by our volunteers Dec. 9 at twilight in a beautiful display celebrating those who have brought light into our lives. Join us at 4:30 p.m. for light refreshments at Christ Episcopal Church Parish Hall, located across the street from the Common. Then join us for a short walk through the luminaria on the Common led by Rowan Tree Bagpiping. A brief program will be held at the gazebo to remember loved ones. Learn more & purchase a luminaria! Alfond Center for Health, Augusta Wednesday, Nov. 28, 5:30 - 7 p.m. Discover five simple actions you can take before surgery to reduce anxiety, decrease pain and shorten recovery time. You will learn mind-body techniques that have been shown to enhance the healing process. Wednesday, Dec. 5-19, 5 - 6:30 p.m.
Have you tried to quit smoking but just can’t break the habit? Hypnosis can help you regain control and stop smoking. In this group setting, you'll identify and overcome smoking triggers, take charge of sabotaging behaviors and become confident in your new life as a non-smoker. MaineGeneral offers many informative and fun classes to help you and your family live life to the fullest. See a full listing and register for an upcoming class!